(Guest) J&C Studios O Gauge Archive Photo Poll: Dec. 2012 Almost Home! B&O Train Number 2, The National Limited from St. Louis arrives at Edgewater on the Baltimore & New York Railway. Several more miles will bring it to the end of the line at Jersey Centrals terminal on the Hudson River and the famed B&O connecting bus service that took passengers to their hotels and other stops in Manhattan and Brooklyn until B&O passenger service to NY ended in 1958. The observation car was built from a 1947 Kasiner kit. 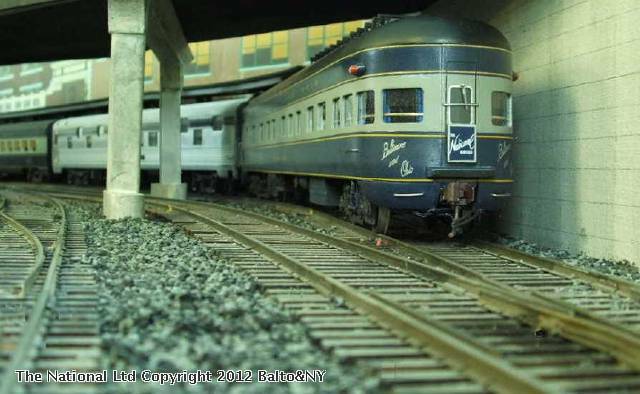 It accurately models the three 1939 Pullman-built 'River' series observations New York Central used on their Southwestern Limited between NY and St. Louis. The cars were sold to the B&O in 1956 and assigned to the National Ltd which also ran between NY (Jersey City) and St. Louis, keeping their original names. This car is the Genesee River. The car ahead of it is a Mac Shops kit 16 duplex roomette/four double bedroom Budd built sleeper of 1954. B&O had several of these cars named after birds. This one is the first of the class named Bobolink. The B&NY Rwy was an actual railroad under B&O ownership from 1888 to 1944. A 5.5 mile line, it connected Cranford NJ with the Arthur Kill and a long bridge to Staten Island. In 1944 B&O dissolved the B&NY as a company and deeded the track to the Staten Island Rapid Transit, which had operated it for the B&O since 1890 when it opened for traffic. Edgewater was the name of Staten Island's largest incorporated village. It stretched a few miles along The Narrows shoreline from Tompkinsville to Rosebank. When Staten Island became part of the City of Greater New York as one of the five boroughs in 1896, the village government was dissolved. Its name lived on in a bank for a long time after. While the history Ive shared here is accurate, the setting as a model railroad is of course freelance. But it helps make a good setting while providing a kind of 'what if' look into the past.